Kids, toddlers and babies love electronics! 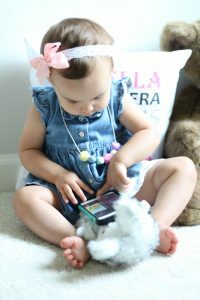 Izzy loves to play games on mommy’s phone when her patience have worn out. I love to hand it over when I am in a crunch and need her to attend to a task for just a few more minutes. We have all been there when we stand in the grocery line and your kid is over it, before the meltdown begins or she tries climbing out of the cart my phone can save the day. If you need a cute and fun holder, I found it! 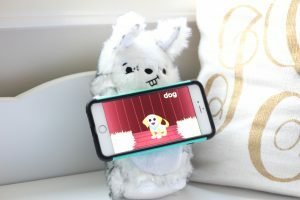 The PawdPet is an amazing stuffed toy and holder for your tablet or phone. Each PawdPet comes with the option of ordering for a tablet or phone. We chose the phone size because when home, out grocery shopping or in a restaurant I always have my phone. 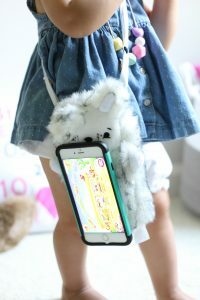 You can easily fit the phone size PawdPet in the diaper bag. 1. It can lay on it’s back or side. 2. It can magnetically hold a phone or tablet. When you open up your PawdPet you will find a small magnetic bar that has adhesive on one side for sticking to your phone. This is what keeps the phone or tablet attached to the PawdPet magnetically. 3. It can protect your phone or tablet by going in the back pouch. 4. It can be carried by hand or with the strap you find tucked in the back pocket. 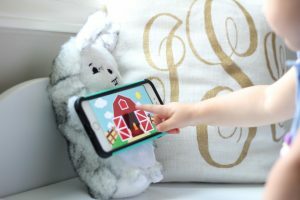 Izzy loves her soft bunny called Bun Bun who holds mommy’s phone. You can purchase Bun Bun here. To see all PawdPets click here. I teamed up with PawdPet for a giveaway so go and enter here. Bun Bun is so cute!!! I think Eukie may need a friend! Yes! Isn’t bun bun so sweet? Izzy is so cute with her PawdPet! How nice to know your phone won’t get broken in little hands. Yes! The perfect little phone or tablet holder! I’m obsessed! How cute!!! 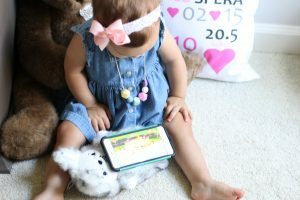 What a great idea – MG calls my ipad ‘peppa pig’ because that’s what she associates it with! This is so smart for toddlers!!! This is such a brilliant invention! I love that it has a strap so they can carry it around!